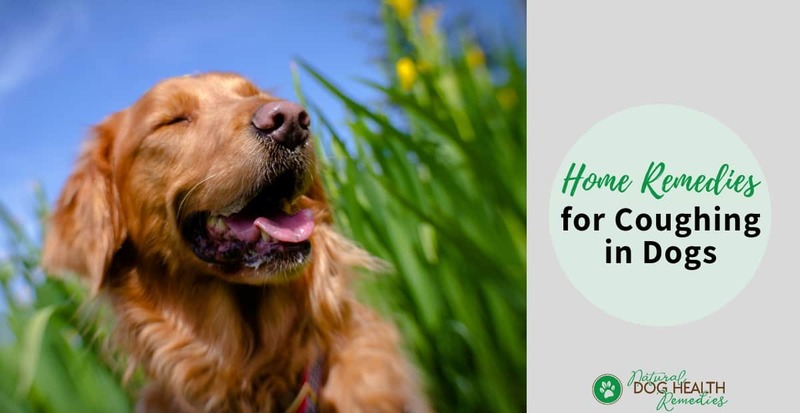 According to many holistic vets, coughing is actually an effective way to help purge foreign particles and bacteria from the respiratory tract. It is therefore not advisable to use cough suppressants to suppress the cough. However, if your dog's coughing is keeping everyone up at night, you may want to use some of the following natural treatments to help soothe the dog's throat, ease the cough, and boost the immune system so that the dog can recover faster. 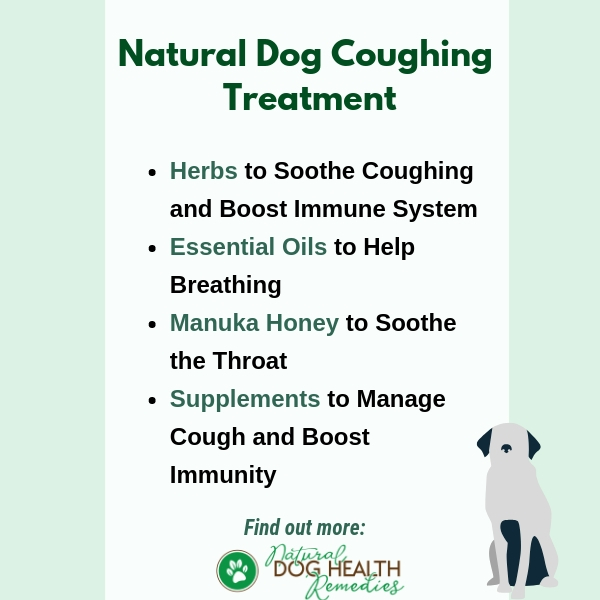 Natural remedies for coughing in dogs include herbs, essential oils, honey, and supplements (vitamins C and E, N-acetylcysteine, essential fatty acids, probiotics). Mullein: Mullein is good for dry coughs such as kennel cough or chronic recurring coughs. Marshmallow: Marshmallow (as well as slippery elm) has a soothing effect to the mucous membranes. It soothes the throat and alleviates dry coughs. Coltsfoot: This herb is effective in stopping coughs in general. Plantain: This herb is effective in treating dry coughs. Licorice Root: This herb strengthens the respiratory system and acts as a suppressant for coughs especially those that seem to be located in the throat or upper respiratory areas. Dogs that have weak immune systems are more likely to get infectious respiratory problems (e.g. kennel cough). Herbs such as echinacea, astragalus, and Oregon grape can be used to strengthen the dog's immune system. This natural herbal formula contains herbs such as coltsfoot, mullein, licorice root, and more, and is extremely effective in treating dogs with cough and respiratory problems. 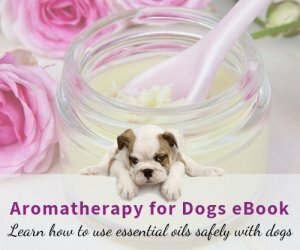 You can also use essential oils to help soothe the respiratory tract, and to calm your dog. Essential oils of lavender, eucalyptus, and niaouli are antibacterial and antiviral. Chamomile essential oil has a calming effect. Use them in a vaporizer or diffuser to help your dog relax and breathe easier. 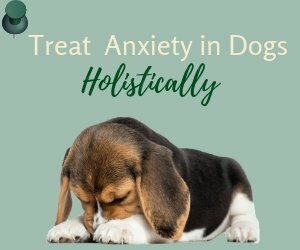 You can also use diluted oil(s) to massage your dog. Add a drop of eucalyptus (Eucalyptus radiata) and a drop of lavender (Lavandula angustifolia) to a tablespoon of carrier oil (e.g. sweet almond oil, jojoba oil). Use the oil blend to massage your dog. Use a sweeping, stroking pattern in a downward direction, start under the throat over the windpipe, and over the chest area between the front legs. Then massage between the shoulder blades along the back in a back and forth motion. Massaging these areas can very often lessen the frequency or severity of the cough. Not only is manuka honey soothing for the throat, it is also antibacterial and antiviral and can speed up recovery from a case of infection, such as kennel cough. As mentioned above, licorice is soothing to the mucous membranes and has long been used to alleviate coughs. N-acetylcysteine (NAC): NAC is a derivative of the naturally occurring amino acid, cysteine. It has long been used to break down mucous and is commonly used to treat acute and chronic lung conditions, including coughing. Essentail Fatty Acids: EFAs have anti-inflammatory functions and an EFA-rich oil (e.g. 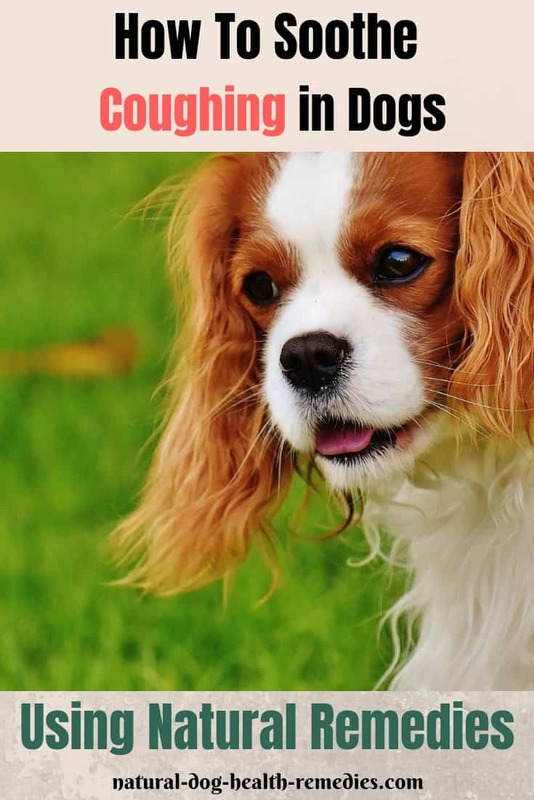 cod liver oil, salmon oil) should be included in a coughing dog's diet (Dosage: 1/2 teaspoon for small dogs, 1 teaspoon for medium dogs, and up to 2 teaspoons for large dogs, once a day). 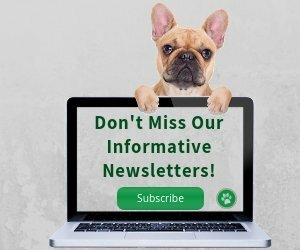 Probiotics can strengthen a dog's gastrointestinal system, which is the first line of defense against bacteria, viruses, and other pathogens. Learn more about some common causes of coughing in dogs.